Check out SO Podcast 117 to hear Kristina talk about the mentorship experiment. First, if you haven’t read the original announcement post about the Stack Overflow Mentorship Research Project, you should go and do that now. If you don’t, the rest of this probably won’t make a ton of sense. 63 mentors from the community volunteered to be our partners. Over the course of the experiment, over 500 new users entered our mentorship chat. 271 of those users had conversations with our mentors. Comparing those 271 users’ questions with questions from all eligible users who did not enter or participate in mentorship, their question score (means upvotes + downvotes) increased by 50%. Because of your feedback, we started the project with a “draft post” feature implemented. When mentees entered the chat, their draft question was copied over. They can edit the draft from there, and then copy it back over to the Ask a Question page when complete. I don’t say this lightly: our experiment would have been a failure if we hadn’t had this from the beginning. Thank you. Here's what the draft post feature looked like. My draft is posted in the chat. I can go edit my draft by clicking the "edit" button. Soooooo now I’ll go through all of the problems with our initial approach, and talk through the solutions we implemented. The point here is that this experiment was very much a learning process. Problem: Overcrowding: As you all correctly guessed, trying to put a bunch of mentorship conversations into one room was a bit of an issue. Multiple conversations going on at once was confusing for everyone - especially for people new to the site. Solution: Multiple rooms: We decided to keep one main private mentor room, but split out the mentorship rooms into four so that conversations, if they did overlap, wouldn’t overlap frequently, because new mentees were cycling through rooms. Solution: Smarter rate-limiting: Jeremy spent a bunch of time fixing the rate at which people were permitted in chat so that it scaled based on the number of people available to mentor instead of as a function of overall traffic. That way, a single mentor can’t get overwhelmed with too many mentees. 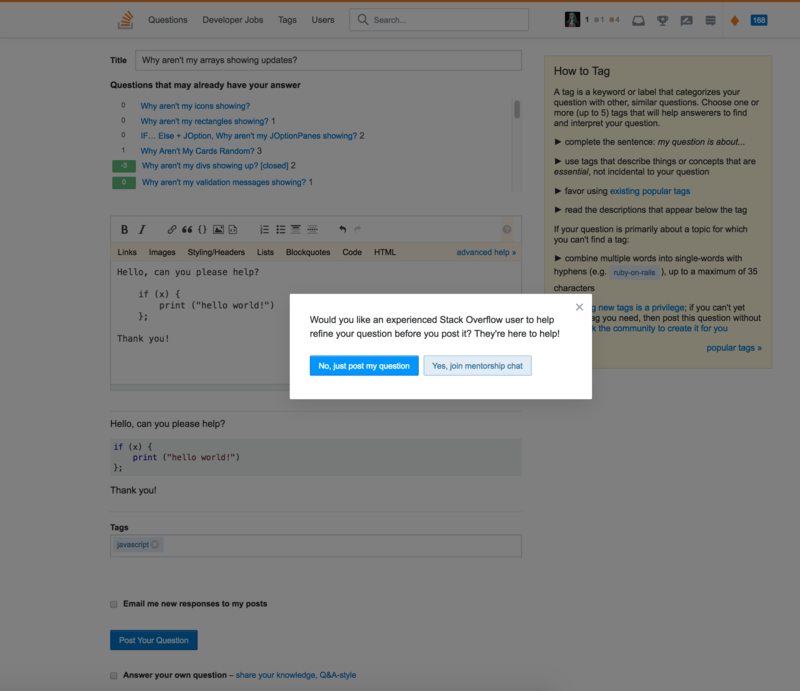 Problem: Entry points: We originally placed the mentorship chat entry point in the sidebar of the Ask a Question page. This was good for only capturing people who had high intention for mentorship, but mentees frequently entered chat with just a title and a line or two, which made it harder for mentors to help them fix up the question. Solution: Change them: We moved the prompt from the sidebar to an overlay that pops up once you’ve finished your question. 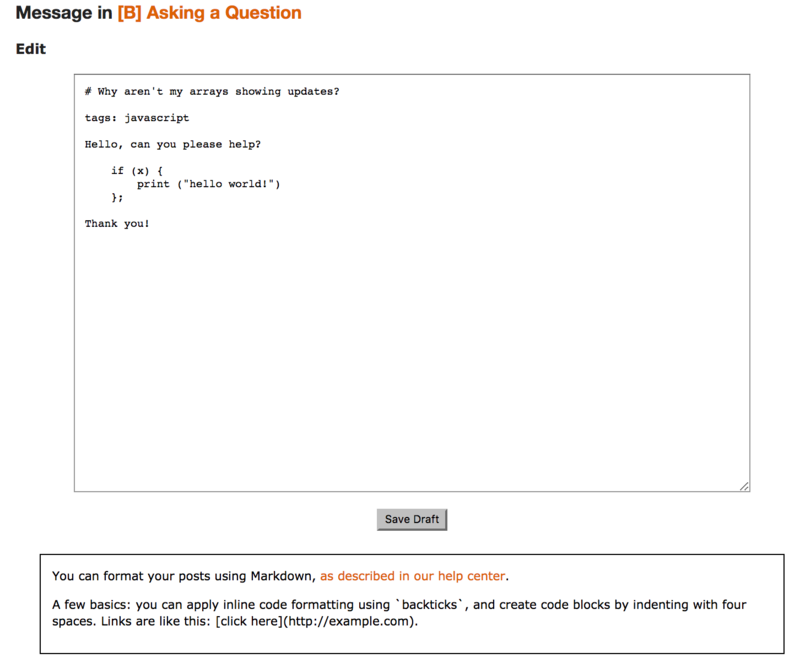 It asks if they want some help with fixing up the question before they post. That way, the question is already finished, and mentors can help much more effectively. Problem: Mentor education: While every mentor that we chose was extremely capable and effective, there were lots of different approaches and opinions floating around, and a good amount of uncertainty about how, exactly, they should help. Solution: FAQs: We quickly realized that we needed an FAQ document for mentors. We collaboratively created guidelines for everything from homework questions to fixing typos in code. This was a good reference for mentors when they were unsure about how to approach an issue. Problem: Delays in response/non-responses: The system wasn’t perfect - sometimes, a mentor would be idling in chat, a mentee would come in… and no-one would notice. Other times, a mentee would come in, and the mentor would spend 5 minutes giving feedback on their question… only to realize that the mentee had left and posted their question anyway. Solution: Kristinabot: We created an auto-response in chat that welcomed mentees, told them a bit about the chat, and asked them to talk a bit about what issues they have. This way, mentees had something to do while waiting, and if they never responded to the bot, mentors wouldn’t have to spend their time talking to someone who wasn’t there. So, now you have a clearer picture of how this worked and what issues we faced… what about its effectiveness? As I mentioned above, question score means increased by 50%. Practically, this means that questions from mentored users had fewer net downvotes than those that were not mentored. Another way of measuring it is by looking at individual question quality. We used a rating system where “good” questions have positive ratings (or neutral with an accepted answer), “neutral” questions have no interactions, and “bad” questions have negative ratings. Within that system, mentored questions had a much higher share of “good” questions, and way fewer “bad” ones. Good questions increased from 18% of all questions asked by that population to 25%. Bad questions decreased from 30% of questions to 25%. All of these results are statistically significant, with p < .05. Continue to experiment with the concept of a draft post. We think that this would enable ad hoc versions of mentoring particularly for smaller communities. It could even replace the “sandbox” that some communities have hacked together. For larger communities like SO, we’re going to explore ideas for a scalable mentorship program - though no promises, here, on any front. We’re also unsure about how chat fits in here long-term, so we can’t guarantee any changes or updates to chat. This will be prioritized in the context of other ideas for improving question quality. Relatedly, if you didn’t see it, Joe posted an update about the DAG team’s priorities yesterday that outlines other relevant work that they’re planning and that they've done. To our mentors: THANK YOU SO MUCH. If it wasn’t for your patience, your dedication, your wonderful and useful feedback, and your Skynet jokes, this experiment would have been a total flop. I’m speaking for all of us at SO when I say that we really appreciate your time and your passion. To our mentees (Are you reading this? Say hi! ): thank you for being willing to try something new, for patiently working through SO’s rule intricacies, and for filling out the survey afterwards. To y’all on Meta: Thank you for the encouragement and tough-but-actionable feedback on our first post. We were able to implement a couple of critical features in this project, including draft editing and room cycling, because of your great ideas and feedback. To the members of the DAG team (specifically Jeremy, Joe, and Pawel): I dunno if I should be thanking you or if you should be co-thanking everyone else with me, but thanks for going along with this idea and, you know, building and designing it. Double-thanks to Jeremy for spending way too many hours making rate-limiting work. To my fellow researchers (specifically Denae and Chris): I guess y’all should also be co-thanking everyone with me, but thanks for putting in so much work and time to make all this happen. It wouldn’t have happened without you. Q: So wait… do you think this was successful or not? A: Yes! By a couple of measures. First, we learned a ton. We learned about the kinds of things that people need help with when they’re first starting (MCVE! Formatting!) and we learned about the logistics of how to pull off a mentorship chat like this. It also proved successful, stats-wise. People who were mentored had overall better questions than people who weren’t. It makes sense to mention here that people who opt in to chatting might be predisposed to asking better questions overall, but anecdotally, most of the questions were in need of some fixing up. Q: You said that over 500 people entered but only 271 had conversations? What gives? A: A lot of people entered chat who maybe didn’t realize what they were doing, or who got there, realized they weren’t going to get answers, and left. This is an issue with the way we implemented this, and we’d need to fix it before we launched something more broadly. Q: How did you calculate your results? A: We looked at all of the questions asked by users in the same population (3 or fewer questions, <16 rep) in the same time frame, and compared them with our sample of mentored users. We compared their mean question scores - the difference was statistically significant. Q: Okay, but how many people really wanted their question to be answered in chat? A: There were some! But many times, when our patient and steadfast mentors explained that they wouldn’t answer the question and instead could help with fixing the question itself, mentees were excited about it and worked to fix up their questions. Relatedly: I’ll be talking about this project on the Stack Overflow podcast that’s coming out this Monday, so you can tune in if you’re super interested and want to know more. I’ll also be hanging out here for a while (with Joe and Jeremy!) to answer questions, respond to feedback, and talk with you all. As a mentor myself I was quite happy with the experiment and I do believe that it may work, however I have a comment in the quantitative results of the experiment. Certainly I do remember that we did help some bad question to become good ones, so that is great! However, how many of the upvotes given to those questions where given by non-mentors? I did upvote questions when I though that the user made a legitimate effort in improving them that I would have no exposure to if I wasn't a mentor, so I think that perhaps if my votes count towards the "hey this worked" conclusion, the metric may be skewed. Certainly not all upvotes would come from mentors, and certainly some of us may have also downvoted questions that were bad that mentees refused to fix, but I believe that the real metric should not take into account the people involved in the experiment, as we were a significant percentage of the people involved in the experiment (63 mentors vs 271 mentees/questions). The influence we might have had in the final result is not neglectable, I believe. Actually, it is very possible that our net influence in the final number is small, but we should not make assumptions. TL;DR: I believe you should re-calculate that 50% figure without the votes from people involved in the experiment. I found it to be refreshing and rewarding to participate in helping new users to ask better questions. true scalability based on active mentors and current question frequency. the ability to mark yourself as "available to mentor" even when you're currently doing 1. Many mentees take a while to respond, so I could easily see myself handling 2-3 at a time if I wanted to. I also participated in this project, and I will submit my two cents about the project and what can be interesting for the future. I had fun, but it was also time consuming, specially teaching each OP to format a post (instructions in chat, wait for result, repeat). My temporary solution after a while was to only concentrate to get all information in the post (and leave out formatting), then once it was posted I went to edit it (format code, etc.). It would have been nice if we had collaborative editing. Keeping the OP in chat (have them respond) was a challenge as you pointed out in your post. Some thought needs to go into this to not waste both the mentor's and OP's time. Personally I had a simple strategy asking first simple questions like "How are you"?, to see if I could get a response and also to establish a minimum relationship avoiding that the OP gave up (darn all this stuff I need to improve) on me in middle of the mentor session. However I think that some hard interface should be put in place that encourage the mentee to stay in chat. In your post, you don't speak about how many posts entered mentor chat, but were actually never posted. My personal experience was that probably all questions in my domain (Java) were never posted. The reason often was that I could easily find a good duplicate, indicate a typo in yet another scanner problem, etc. In all these cases the OP seemed happy to not post (compared to all the mess in comments on heavily down-voted posts). As I see it, this was a major positive result by the mentor chat (both for community users and OPs. Jon and others have more time to answer a good question). I am aware that this can also be dangerous; chat becomes a help-center to teach how to search the web, but currently I prefer to indicate how to search, instead of involving multiple community users to review and execute moderation actions on the post. We also avoid a fair amount of resource requests, super user, etc. questions even if it was harder to convince the OP and keep them in a good mood. This is related to the previous point, but also it's simpler (and for some, more fun) to mentor when you have domain knowledge. The final result of the mentor session will normally be better, and I think it will be easier to get mentors to participate if they can do it on tags that they like; they feel more secure and often more motivated. Probably it's no surprise that a new user with some mentoring can post (or not post off-topic) a question better than without. The challenge is to find mentors (of the 63 volunteers probably only a handful was really active), that are willing to invest time and have fun. I had fun, thank you Kristina. I took part as a mentor. Overall there was only one main difference which I saw in the mentees versus in the wild so to speak. Attentiveness. In chat, if we asked for an update or an inclusion, the mentees would very often make an attempt at doing that for the question to be well received. In SO main, if you ask an OP to make an update or an inclusion, the odds are pretty low that it will happen. To me, this was the main distinction. If nothing else, this process allowed for new users to experience how attentive they need to be in order to produce a well received question without actually having a question pulverized on the main site. It was also interesting to see the reasoning behind some very, very, very low quality questions which would normally not see the OP return. For the most part, a request for terminology seemed to be behind these posts. I think many times when a user asks how to foo the bar, we assume we need to make it for them, when often this assumes some malice. New users don't tend to ask for implementations so much as terminology or a broad view of how to accomplish the task, but it certainly reads as "build me the next facebook app" to most veterans here. I am not sure what reconciliation process is available there, but it would be nice to sort it out so we don't constantly feel like people are asking us to do free work in the form of building or researching; and so new users don't constantly taken aback for asking about identifying process or technology. One aspect of the workflow that sparked my interest was the ability for this to be turned into a queue. There is a preview, a chat room the user is in, and an entry point. I would imagine that there should be a way to make a queue for these mentee requests as the basics of the tooling are already built. This could greatly help build community and increase question quality. I think the staff running this experiment did an excellent job. Jeremy did very well implementing the feature sets, Kristina was very available for communications and kept everyone in the loop, and Joe provided insights and feedback into the overall process. As a mentor myself, I really enjoyed participating in this mentorship project, and I liked to guide people in all ways whether the question was blatantly off-topic or it had serious problems that needed to be fixed or it was just a fair enough question and just needed to be double-checked before posting. Not use 4 chat rooms only: A better approach but more costly to implement is to create separate chat rooms for each new mentee, so that the mentee doesn't get overwhelmed with the last mentorship session. Being able to see old sessions is not a good experience for the mentees. The chat should always be kept new and clean, so that no confusion occurs. I know that creating a new different room for each mentee is not completely feasible, but it would be more than great if that can ever get implemented. Add status for messages such as "delivered" and "seen": To solve the problem of having mentees ignoring the messages we send that we sometimes waste our time to write, it would be a very good idea if that feature can be added to know whether the mentee is available to be mentored or not. Add the possibility to claim questions with certain tags only that are defined by the mentors themselves: That will not only help the mentors' mentorship process but also will give a much better experience to the mentees themselves as the question will now ask about a certain tag that the mentor is very well-aware of and would like to help improve this question according to his/her area of expertise/interest. Minor related feature: Adding the ability to claim any kind of tags in general is also a good addition to this feature if the mentor prefers to do so. Add the possibility to mark oneself as available for mentorship: Adding something simple like a checkbox will already get this feature easily implemented. Sometimes the mentor likes to read or even chat in the Private Mentor Chat room without wanting to help any mentee at the same time. I find adding this feature will solve the problem of having few mentors available online, as during the experiment we needed to leave the Private Mentor Chat room when we are not available or just currently doesn't want to mentor someone, so that the system doesn't list us as available. Add a button to all pop-up questions in the Private Mentor Chat room that acts as a claiming method: Generally during the experiment, we needed to say something like "I've got [mentee's name]", so that other online mentors know that someone already got this and took care of it. Ideally, if we can add this button, thereby when pressed, some text gets appeared at the right instead of the starboard, that shows something like "[mentee's name] is currently assigned to [mentor's name]", that will give an easier and better experience to the mentors themselves. Add the ability to edit the question with the mentee through a collaborative editing window: Through my experiences, being kept to tell the mentees to fix that and that and that, then post another draft, that did surely got boring at some point especially when trying to teach the mentee how to format his/her code. Adding this feature will save not only the mentor's time but also the mentee's time. I understand that that might already get fixed by other SO members by just editing the question when posted. However, the main idea of this project is to teach new users how to ask a new good question, so that in future questions, the mentee already has some quite knowledge on how to write a good answerable question as well as some knowledge in how to format the code. So by saving time, editing the question with the mentee collaboratively and discussing the changes with him/her through chat is a whole another level of mentoring new users. Edit: After having a second thought of gaining reputation and seeing the stuff that went around Documentation, there have been some nonconstructive documentation. Gaining reputation might not be a good idea because sometimes there might be mentors who would just like to edit mentee's questions quickly without concern only for the sake of "reputation". So it's definitely not a good idea. It should be a volunteering work. Remove the starboard for the mentorship rooms: Thinking about the starboard, I think it's useless for mentorship rooms, especially if we are going to create a new room for each new mentee. Through my experiences, no message got starred either by a mentor or a mentee. A better feature to compensate that right side panel is to divide the screen into two halves, at the left side the chat as it is now, and at the right side the collaborative editing window. At the end, all these points were just my thoughts and suggestions. If you have a different opinion or have any comment on any of the above ideas, it is surely welcome. I would like to know your opinion as well. Anyway, I really feel this project will become successful and will have a promising future only if some more features get implemented. TL;DR: The mentorship chat rooms should have a different layout unlike the normal chat rooms, to be able to give unique features only made for mentorship purposes, and remove all the unnecessary unused stuff such as the starboard. Their questions were easier to understand - as either the mentees themselves improved the formatting as per mentors' suggestions, or the mentors fixed grammatical issues after the question was posted. During the experiment, if I was the only person in the chat, I'd be assigned a mentee by default. It doesn't give me the opportunity to decide whether or not I can help someone. It might be a helpful feature for future phases of the project. On one of the occasions, I had to spend roughly an hour with a mentee - who struggled to understand basic details such as where the edit button was. I suspect, it would get annoying for anyone if the mentees take too much of their time. Also, there is no polite way of saying, "You are taking too much of my time"! The mentees are definitely better off, but can we reduce the time the mentors have to invest? Perhaps as Antti Haapala mentions, leaving a set of comments, and moving on? As Antti Haapala mentions, all we could do is suggest improvements, but could not edit the draft ourselves. The reason was to let the mentees learn by improving the questions themselves, i.e. if the mentors just edited the questions, the menteed may not learn much themselves. I think this point should be revisited. The mentors could save some of their time if only they could fix minor formatting issues in the draft themselves rather that educating the mentees. I believe most mentees would still learn from that. I liked the experiment purely because the mentees almost always benefited from the interactions. If I had to, I would participate in the project without any of the above mentioned improvements. But I would really appreciate if it took me lesser time per question. Another thing that comes to my mind is today's announcement about Question templates (among other things). I feel they could be more effective in improving question quality in comparison to Chat! I understand it is just an idea at the moment, but I like that better than mentorship. I think the real proof will be in the pudding. Will the mentees produce better questions long term, becoming good contributers to the site? I'd like to see a 6+ month follow up to see how this mentorship has impacted both these users future questions/answers, and general behaviour on the site. This has been brought up before, and I personally feel that this was something that was needed, because I (and I'm sure several other mentors as well) found myself reminding almost every mentee that they should add their code (if any) as well as mention whatever research they had done, or conversely, ask them to research their problem a bit first. The day that I received the aforementioned email with a link to the private chat, I saw numerous mentors coming into the chat, and this continued into the first week of mentoring as well. There were infact times when there were mentors sitting idly in chat (including myself) with no. of mentees > no. of mentors. However, after the first couple of days of the experiment, the no. of mentors dropping in to mentor dropped noticeably, and the absence was even more pronounced as the days followed. This absence of mentors would in turn lead to times when available mentors were juggling between >1 mentees. This was rectified by the updated rate limiting, however, the temporary halt to the experiment was only mentioned in the private chat. During the second week of mentoring, there were several mentors (who'd been assigned the second week of the experiment to mentor in) who came into the private chat and only then found out that the experiment had been halted temporarily. the goal of this project is threefold: (1) to increase question quality overall, (2) to improve the experience for new question askers, and (3) to learn how to scale these benefits to the whole community. The quality of the questions posted were certainly better after the mentee had been guided by the assigned mentor. The mentorship also meant that duplicates were resolved in the chat itself. All in all, this was a good experiment, and because it was an experiment, it was obviously not perfect and there is a lot of room for improvements/ additonal features (all the points mentioned by the other mentors above) to be added to the mentorship program if it is to be introduced as an integral part of the SO community, and I look forward to seeing this experiment growing to become one. Congratulations to the team and volunteers on a prototypical experiment. There are ample users on Stack Overflow who participate (and answer) because of the fun and hunt of reputation and rewards and not primarily because of helping others or making the content qualitative or better for future readers per se. The reputation and badges are fun and simply exist because they are loved. Moreover there are some users who want reputation and a good Q&A profile for mentioning in resumes and/or developer jobs. Having said that, I still believe that SO is a strict Q&A site and Not a Forum, and by moving in a direction of using chat seems to break this strictness. Even though the previous post said that mentors won't answer the questions, but will help new users to improve their question quality, this might be a goof up, as a person looking for answers won't be so patient as to learn 'how to ask' when there are other alternatives out there in the huge digital world which can answer him without extra and unwanted forced teachings. It is even a little strange how SO is putting more money and resources in just to teach 'how to ask', instead of other high-priority tasks (according to me) like making high quality answered questions more discoverable (you can't rely only on search engines, can you? ), or making developer jobs more convenient for freelancers or part-timers; the list is long. Well, let's hope that after lots of community involvement, this feature does not sunset like "Documentation".